2. Favorite Companion – This is also a hard one. There are so many things I like about the different companions, different facets that I feel were very important and brought out different things in The Doctor. However, Rose has always been my favorite companion. (Don't even start with me if you're a Rose hater. Just...go away. Rose was my first companion and I like her.) I feel like she and Ten were good for one another - he helped her to see herself as someone important, who could be something more and she helped him to learn to care for someone again. I was so happy to see them finally reunite in the end, albeit a different iteration of Ten. 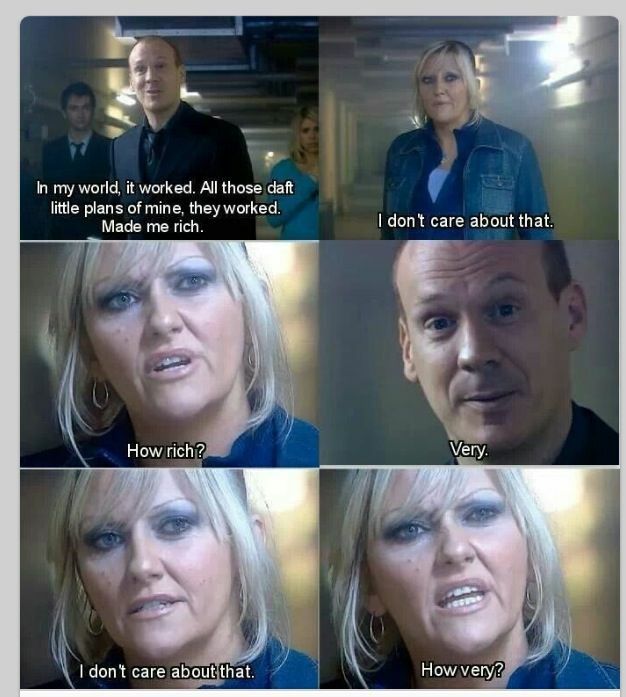 I also loved that she was back for the 50th. 3. Favorite Season - Probably Season/Series Seven. I've loved seeing how Eleven's story has progressed and it has had all of the things I feel are important for it to be a great season - simply hilarious moments ("Dinosaurs on a Spaceship"), tearjerker stories ("The Angels Take Manhattan") and cliffhangers ("The Name of the Doctor"). 4. Least Favorite Companion - Martha. I hate saying that because Martha had a lot of potential and background, and I did enjoy her...but I feel like she was kind of just left to be filler between Rose and Donna. I don't feel like the writers really gave her as much interesting "stuff" as some of the others. She did do some really amazing things, however and I do like that she was so headstrong, that she left of her own volition, and then went on to find happiness. 5. 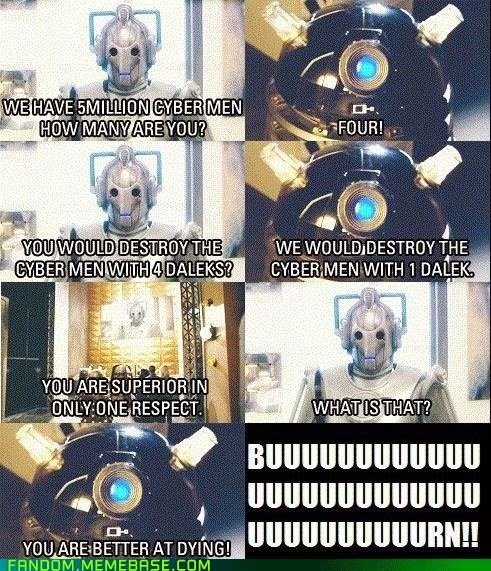 Favorite Monster - Daleks are first with Cybermen being a close second. Both are creatures without emotion, pity, or compassion...but I still like them. And you've gotta admit, the verbal repartee between them during "Doomsday" is HILARIOUS. 6. Favorite Episode - How can I choose *just* one?! Ok, fine. Hmmph. If I had to choose...it would be "Closing Time." I really liked Craig Owens character when we met him in "The Lodger." I wish we'd seen more of him. As a parent, all the talk of parenting and difficulties Craig mentions in the episode is so true to life. And him defeating the Cybermen with love, breaking out of that cyber suit to save his crying baby? That is the power of parenthood and love. I get teary-eyed every. dang. time. 8. Funniest Episode - "Dinosaurs on a Spaceship." 9. Least Favorite Monster - I don't know if this qualifies as a monster...but on "The Waters of Mars" when the people go all zombie-like with black teeth and have water pouring out of their mouths? That freaked me out. Yuck. Bleck. It's still hard for me to watch that episode. 10. Favorite Doctor Catchphrase - "ALLONS-Y!" 11. Favorite Actor - Arthur frakking Darvill. Rory Williams is such an incredible character - "A Good Man Goes to War" anyone?! - and Arthur plays him brilliantly. He's funny and so matter of fact about everything. So loyal and committed to the ones he loves. 12. Favorite Actress - Catherine Tate (Donna) with Alex Kingston (River Song) as a close second. 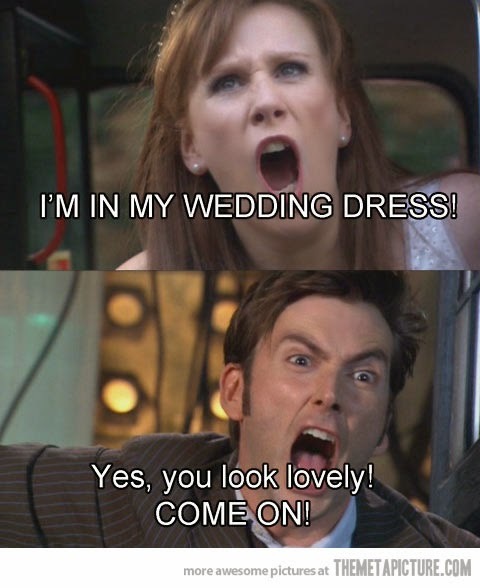 I love Donna. She is probably my second favorite companion - mainly just because she's so darn sassy. She always tells the Doctor exactly what's on her mind, just as it is, no filter. I think that's also why I like River so much. 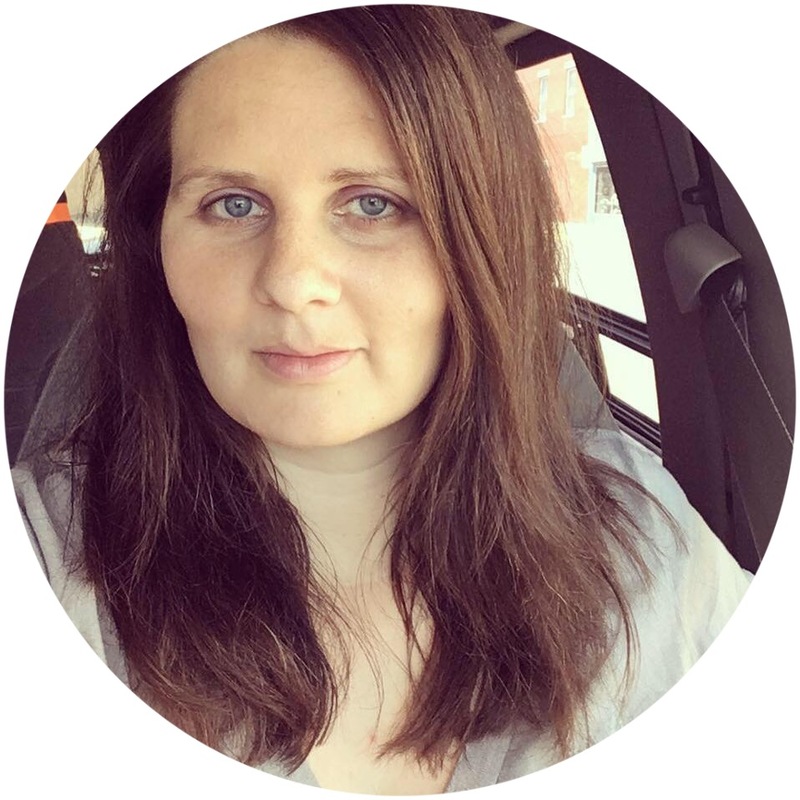 She's another take charge kinda gal who isn't afraid to speak her mind. 13. Favorite Special Episode - "The Day of the Doctor" is definitely my favorite special. I loooooved The War Doctor and just the whole dang story in this episode. I also loved the interactions between Ten & Eleven and the incorporation of the older doctors. However, "The Next Doctor" is also very high up on my list. 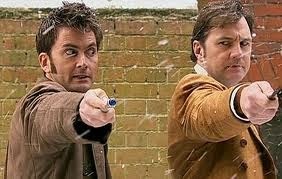 David Morrissey AND David Tennant? Mmmmmm. I apparently have a thing for David's. Need I say more? Ok, fine...I'll say more. It was a really intriguing and interesting episode - the beginning hooks you right off the bat as you wonder if this is some other iteration of the Doctor that we haven't yet seen. Adelaide: State your name, rank, and intention! The Doctor: The Doctor. Doctor. Fun. 15. Scariest Episode - BLINK. Waters of Mars is scary but Blink is much scarier, in my opinion. Especially since my oldest son and I watched this episode for the first time together, at night, after the other kids were sleeping. Not a wise idea. I asked him multiple times, "Are you okay? Want me to turn it off?" and he kept saying no, he was fine. However, I myself found it hard to sleep that night and I noticed his light stayed on too. 17. Least Favorite Character - Hmmm. I can't really think of anyone I haven't liked. 18. Favorite Friendship - Bernard Cribbins (a.k.a. 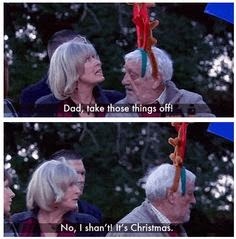 Wilfred Mott) and Ten. Wilfred was always such a friendly old fellow and cheery. He was so much fun. 19. Least Favorite Season - I don't think I have one. ~ "DOOMSDAY." Hands down. I bawl like a baby every frigging time. ~ "The Time of the Doctor." His speech at the end. I just...can't. SO MANY TEARS. Awww I love this post! What fun! Love all of your answers and think you are spot on with all of them! Allons-y!